For many people who grew up in the late 80’s and 90’s, classic NES and SNES games will always hold a special place within us. So, even though console gaming nowadays includes detailed, realistic graphics, we still yearn to play that Mario game, or get excited whenever we hear a popular 8-bit game tune. We can’t blame ourselves; there’s a lot of nostalgia involved here! With the help of emulators available for both iOS and Android platforms, developers have made it possible to bring many of our favorite classics to our smartphones and tablets. 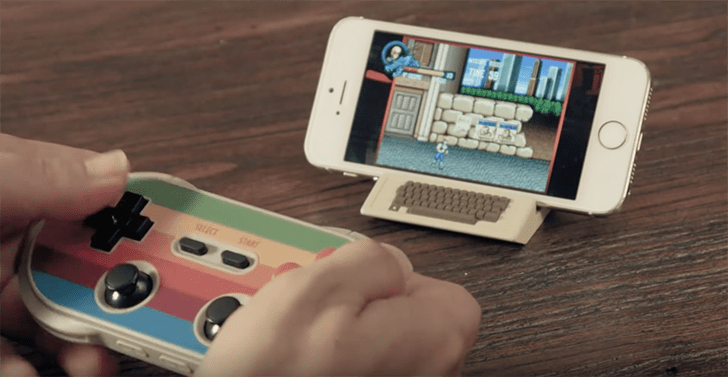 Still, for dedicated gamers who want to press actual buttons instead of virtual ones on the screen, game controllers can optionally be paired up with your Android and iOS devices to provide a near-complete retro gaming experience. In this article, we’ll let you know how to setup your iPhone, iPad or Android device to play retro classic games from NES, SNES, Atari, GameBoy, etc. It might be an iOS/Android port of a classic NES, SNES game, available on the App Store or Google Play. It might be available as a raw game file; for example, with a .nes or .snes extension. In the first case, the game may directly be downloaded from the App Store or Google Play Store and you can start playing by simply launching the game from the Home Screen or App Drawer (in case of Android). In the second, the game file may need to be separately downloaded, along with a suitable Emulator app. Most retro classic emulators won’t be directly available on the App Store, but may be installed from external sources. Many of these are available on third party app stores like BuildStore, which do not require jailbreak to install them. For Android devices, many SNES, NES, GameBoy, etc., emulators are available on Google Play Store, but you may also download them from the Internet. GBA4iOS 2.1: GBA4iOS is a Game Boy Advance Emulator for iOS devices, with built-in AirPlay support, as well as support for MFi certified game controllers. This provides you the big screen gaming experience, while also being suitable for people who prefer to use controllers. One can download games and manage them within the emulator app, so there’s no need of file management. NDS4iOS: NDS4iOS is a Nintendo DS emulator for iOS devices, which is a port of the multi-platform DeSmuME 0.9.10 for iOS. Like GBA4iOS, it also features built in support for MFi controllers and AirPlay. Game files need to be copied into the emulator’s in-app storage, in order for them to be detected. MD.emu: MD.emu is a full-featured Sega Genesis, Mega Drive emulator for iOS. The app includes iTunes file sharing option to copy game files to its in-app storage. HappyChick 1.51: HappyChick is one of the most comprehensive game emulators, supporting a wide range of arcade (MAME/FBA) and retro game formats, such as GBA, GBC, MD, SFC (SNES), FC (NES), PSP, N64, NDS, PS1 and DC. This also requires you to copy supported games to the in-app storage in order to play them. Below are some Android Retro game emulators that are available for download from Google Play Store. Nostalgia NES: Nostalgia is a great NES emulator for Android, which is based on the latest version of FCEUX. It does not contain any built-in games, but supports importing games via .nes or .zip files stored on your Android device. The emulator features some unique features, such as Multiplayer WiFi controller mode (with support for up to 4 players), Rewind Mode and more. Snes9x EX+: Snes9x EX+ is an open source SNES emulator based on Snes9x 1.53. It includes a public domain game called Bio Worm. However, users can import other games from the Internal Storage or SD Card. Supported file formats include .smc and .sfc; zipped formats such as .zip,.rar and .7z are also supported. MegaN64: MegaN64 is a Nintendo 64 emulator for Android, which is a modified version of the open source Mupen64+ project. As with other emulators on the list, MegaN64 does not include any game files. Games stored on the Internal Storage or SD card may be played using the emulator. Once you have installed a suitable emulator on iOS and Android, you can load any supported game and play using the usually customizable, virtual, on screen controls provided in the emulator interface. For a better experience, you may also opt for a suitable game controller that supports your device and the emulator. Most of the emulators mentioned above are compatible with external gaming controllers, which may be wirelessly connected to your iPhone, iPad or Android device via Bluetooth. Below are some decent gaming controllers that are compatible with most of the iOS and Android devices. 8Bitdo is a popular gamepad designing company established in 2013 that builds retro-style game controllers for modern devices, including Mac, PC and iOS / Android devices. It has a number of Bluetooth game controllers in its lineup, including a new Kickstarter entry named the AP40. The AP40 is a Bluetooth gaming controller inspired from Apple’s original multi-colored logo. It is compatible with Android, iOS, Mac, PC and more. Other significant releases from 8Bitdo include NES30, SNES30, NES30 Pro, 8Bitdo Zero, etc. All iOS/Android supported 8Bitdo controllers are MFi certified and are compatible with the latest iOS devices. The Stratus mobile gaming controller is a premium wireless controller designed for the iPhone, iPad and iPod Touch, built for superior gaming experience. It is compatible with all iOS apps with external controller support. The Stratus XL is a powerful wireless gaming controller for Windows and Android devices with built-in Steam support. The Bluetooth connection is reliable with almost zero lag — just as responsive as other major game controllers. Some other Android and iOS supported Gaming controllers include ICade 8-Bitty Wireless Retro Game Controller, Gametel Portable Wireless Retro Game Controller for smartphones, and BEBONCOOL Wireless Bluetooth Game Controller for Smartphones and Tablets. Was the information provided in this article helpful? Let us know in the comments below to help us make our content more relevant to you.